Last Tuesday, Nov. 27, Bodies of Diversity (BoD), formerly known as Brothers of Diversity, hosted this year’s Multicultural Student Organization Panel, in which 13 of the College’s multicultural organizations, including African Students Union (ASU), South Asian Committee (SAC) and the International Student Association (ISA), joined together to express the hopes, concerns and goals of their organizations. These organizations, along with others, shared their perspectives on questions raised by moderator Robyn Newcomb ’20. According to Madelyn Cobb ’21, public relations chair of the Black Women’s Organization (BWO), a panel such as the Multicultural Student Organizaiton Panel is very important for expressing the needs of different organizations. “The [Multicultural Student Organization Panel] is important for the campus community because it allows the majority to see minorities unified as a group who experiences some of the same struggles instead of seeing us as different groups pit against each other,” she said. Cobb’s opinions on the importance of the panel were shown in the similarities of the answers to the questions on the panel. 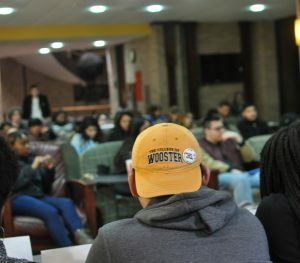 One of the main themes of this year’s panel was the support the multicultural organizations receive on campus as an organization and for individuals who may identify with their organizations. Discussing this theme is especially topical, as some multicultural organizations such as the ASU and Minorities in Stem (MIS) have previously expressed their concerns with the lack of administrative, faculty and student support for their organizations and student members. This panel gave both representatives of the organizations and audience members the opportunity to not only get to know the organizations on campus but also what their struggles are and how they are tackling the issues head on. While the organizations generally had similar hopes for changes in the future, they differed in some ways. Several groups sought to expand their membership, not only to those who identify with the targeted demographic but also to those who don’t share that identity. Cobb expressed her organization’s desire to diversify its membership. “It’d be really neat to see other minorities attending our meetings. Even though we’re a Black women’s organization, we have men come to our meetings, so even if you don’t identify as a Black woman, you can still join,” Cobb said. Similarly, President of the Black Students Association (BSA) D’Khorvillyn Tyus ’19 addressed a common misconception surrounding her organization. “I feel like a lot of people think that we’re only for black students, and that’s not true at all. We have people from all other backgrounds that come to our meetings. If you can’t come to meetings, you can come out to events and support us in that way too,” she said. Other groups’ concerns were rooted in some of the systems of the College, such as administrative or faculty support of their organizations. Cornelius Gyamfi ’19, president of ASU, reiterated previous concerns regarding the faculty and administrative support of the organization. He and the ASU are still advocating for more faculty and staff support of the group and the individual members of the organization. Other groups not only expressed their concerns, but also the events and aspects of their groups that they’re proud of.